Hey guys! 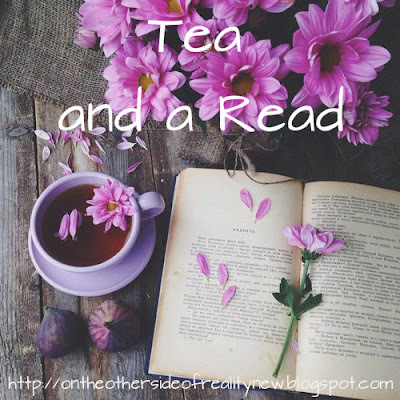 Tea and a Read is a monthly link-up created by the fabulous Kathryn wherein you share a book you've been reading and tea you've been drinking that month. Without further ado, I hope you enjoy! The tea I've been drinking lately is this blend called Willow Stream Spa. I've never had anything like it before - it's a black tea, but with a really rich fruity undertone. I didn't think I'd like a black/fruit tea mixture, but this one is really good. I've been reading Inspector of the Dead by David Morrell. I'd never heard of this author before, and I was gifted this book (his most recent) at a writing workshop. I confess, it's something that's not usually my thing - a Victorian murder mystery - but I'm actually really enjoying it so far. EMILY AND SEAN I SHIP IT SO MUCH AGH. Ooh, I love the color schemes you choose--everything matches! Beautiful photos. WOW OKAY this sounds like the best idea for a link up ever. I DEFINITELY HAVE NOT BEEN DRINKING ENOUGH TEA LATELY GAH. BUT I have been reading Brown Girl Dreaming, by Jacqueline Woodson and The Raven Boys, by Maggie Stiefvater. Both really good. I've heard Brown Girl Dreaming is really good! I really recommend it! It's most excellent so far. As usual, I've been drinking Orange Pekoe....because that's who I am. I also just finished Clockwork Princess by Cassandra Clare......my poor heart is forever broken. But I'm currently reading WoT #11(Knife of Dreams) AND IT'S GIVING ME ANXIETY. DON'T SPOIL ANYTHING! I just finished #9. I have a few books I want to read before I continue the series (I JUST GOT NATHANIEL PHILBRICK'S LATEST BOOK IN THE MAIL AND I AM EXPLODING OF HAPPY), but I'm quite looking forward to it! Neat! Neat tea and interesting read. Thank you for sharing!